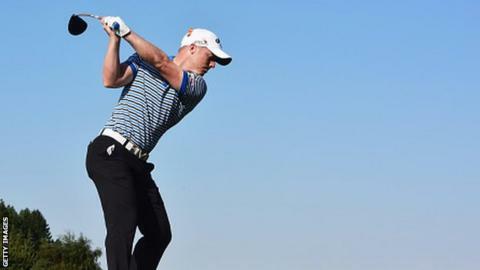 England's David Horsey won the Danish Open by two shots on Sunday to claim his fourth European Tour title. The 30-year-old took a one-shot lead into the final day at Himmerland after rounds of 63, 67 and 68. He then shot a 73 to finish 13-under-par and beat Terry Pilkadaris, Kristoffer Broberg, Daniel Gaunt and Soren Kjeldsen into tied second place. Scotland's Paul Lawrie and Wales' Bradley Dredge both finished one shot further back on 10 under. Stockport-born Horsey led from wire-to-wire, with Thursday's round including a 28 that equalled the lowest nine holes on the Tour this season. Horsey shot three bogeys and one birdie in his last round, but it proved enough to hold off the challenge of Broberg. The Swede climbed 50 places on the leaderboard after firing nine birdies in his final round. It meant he carded a 62 on Sunday, but that left him two short of Horsey's 271 overall.